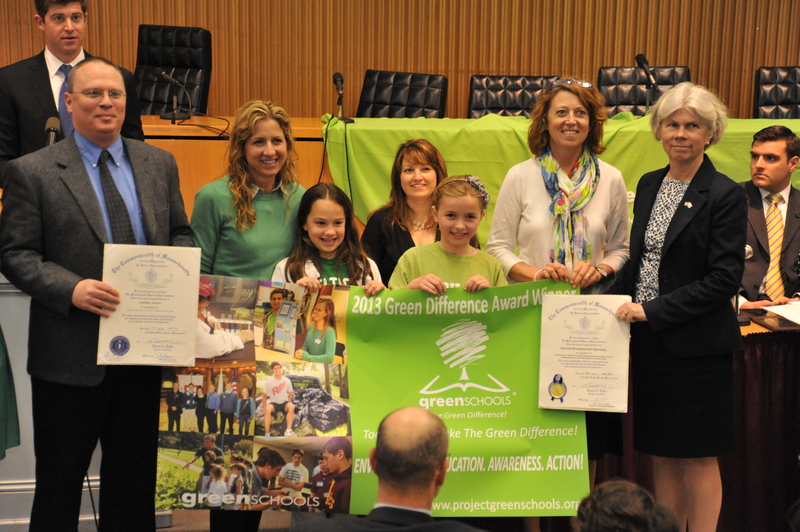 Sprague parents, students, and teachers received a Green Difference Award at the State House last April. Not every Wellesley High School graduate’s senior project is designed to help save the world. Oftentimes, a senior will choose to investigate their career interests or do an academic project within the walls of the high school. But that isn’t the case for Class of 2014 seniors Anna Carney ’14 and Emily Carey ’14, however. For their joint senior project, Carney and Carey have chosen to work with students and teachers at Bates Elementary School to help them reach a bronze-level Wellesley Green Schools certification for their classrooms. The certification is a district-wide criteria developed by Wellesley Green Schools for each elementary school and the middle school to evaluate their sustainable practices in the classroom. Requirements to meet a bronze-level certification include minimizing unnecessary light use, turning off idle projectors, providing a bin for reusable paper, and having students sign the Green Classroom Pledge. Carney and Carey are working to implement the outlined habitual changes at Bates through reaching out to a wide variety of the school’s community. They plan to hold a faculty meeting to explain their goals to teachers and administrators, as well as speak at a Parent Teacher Organization (PTO) meeting to help parents understand their role in the classroom. The most challenging communication they foresee is that which will take place between them and the students themselves. The bronze-level certification was created in 2011, based off a project completed by the WHS Green Team in high school classrooms. Adapting the already-existing checklist used by the high school students to direct teachers and students’ energy use, Wellesley Green Schools converted it into criteria that would educate elementary and middle school students in environmental responsibility. The first school to meet the certification was Upham Elementary, which was led to do so in 2012 by Sara Bua and Jess Stanton, among other parents. Parents at Sprague Elementary followed suit and guided the newer elementary school to reach the certification by March of the following year. Schofield Elementary finished two months later with the help of Jessie Klinck and Nikki Salzman, two WHS seniors doing their senior project. Parents Sue Morris of Fiske Elementary and Ainsley Martin of Hardy Elementary both helped their respective schools finish this year. In addition to Bates, Hunnewell Elementary is also on track to be finished by the end of the year due to the efforts of Jenny Cavallerano and Lisa Parizeau. Last year, Sprague was also recognized for its “green” improvements by the statewide organization Project Green Schools, which awarded the elementary school with a Green Difference Award at the State House last April in the category of “Commitment to Environmental Education”. The school received praise from notable figures ranging from Representative Alice Peisch to Boston City Councilor John Connolly. Once Bates and Hunnewell have finished the meeting the requirements for bronze-level certification, Wellesley Green Schools will be ready to take more steps towards classroom sustainability. According to Phyllis Theermann, the group’s chair, Wellesley Green Schools plans to create a silver-level certification next year. “Our goal is to inspire ecologically-minded students with actions they can use for a lifetime,” said Theermann. “[But] in the end, it is really up to the teachers to embrace the ideas we present and bring their own inspiration into the classroom after our project is over,” added Carney. April 28, 2014 in News.